A Russian rocket carrying the Soyuz TMA-7 spacecraft launches space tourist Gregory Olsen, ISS Expedition 12 commander Bill McArthur and Expedition 12 flight engineer Valery Tokarev into orbit at about 11:55 p.m. EDT (0355 Oct. 1 GMT) Sept. 30, 2005. This story was updated at 2:41 EDT. A Russian rocket launched theworld's third space tourist and two astronauts into orbit Friday, beginning atwo-day trip bound for the International Space Station (ISS). 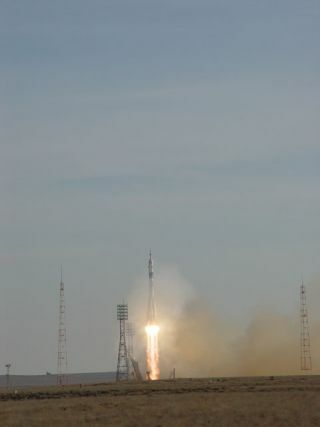 Tucked inside their Soyuz TMA-7spacecraft, space tourist GregoryOlsen and the twelfth ISS crew lifted off from their BaikonurCosmodrome launch pad at about 11:55 p.m. EDT (0355 Oct. 1GMT) after a smooth countdown on the steppes of Kazakhstan. "The crew is doing well, everythingis fine on board," Soyuz commander Valery Tokarev, who also serves as flight engineer for ISS Expedition12, said from orbit. Tokarevsat in the center seat of the Soyuz TMA-7 spacecraft and was flanked by Olsenon the right and Expedition 12 commander Bill McArthur, a NASA astronaut, onthe left. "To watchthis flawless launch on a beautiful day is just amazing," said Bill Gerstenmaier, NASA's associate administrator for spaceoperations, who attended the launch. "[The crew] will be maintaining the station andthey'll have an exciting and very busy increment." The Expedition 12 crew and Olsenhave a two-day orbital chase ahead of them and will conduct a series of threeengine burns to raise their orbit to meet the ISS. Docking at the orbitallaboratory is currently scheduled to occur at about 1:32 a.m. EDT (0532 GMT) onOct. 3. While McArthur and Tokarev are relieving the current crew aboard the ISS - Expedition11's Sergei Krikalevand John Phillips - Olsen is paying $20 million to visit the orbitallaboratory. He is the third fare-paying visitor to the station under a contractbrokered with Russia's Federal Space Agency by the Arlington, Virginia-basedfirm Space Adventures. "Today marks another triumph incommercial space travel," Space Adventures CEO Eric Anderson said in astatement. "Greg has been committed to this mission since day one." Space Adventures also brokered the ISS flights of Dennis Tito in 2001 and Mark Shuttleworth in 2002. "It's a very challenging program,but I enjoyed it," Olsen said of his training during a prelaunchpress briefing. "It was really one of the highlights of my life." Olsen's road to space has not beenproblem-free. After initially announcinghis intention to fly to the ISS in March 2004 and beginningflight training one month later, Olsen cut short his preparations when Russianspace officials reportedthat he had an undisclosed medical condition that prevented him fromcontinuing. That medical condition was laterresolved and Olsen resumedflight training on May 14, 2005. "This has been two years of very hardwork for me," Olsen said at the briefing. "I don't think anyone with six monthsof preparation would be able to fly this mission, it takes years of practice." Another glitch concerned Olsen'sscience plans for his time onboard the space station. He had hoped to tote an infraredcamera built by his Princeton, New Jersey-based firm Sensors Unlimited, Inc. tothe ISS, but was ultimately unable take it aboard Soyuz. Instead, he willperform three medical experimentsfor the European Space Agency (ESA) during his eight days aboard the station.Olsen, who prefers the term "spaceflight participant" to "space tourist," willalso speak to students from his orbital perch and observe the Earth. "Greg has already outgrown the titleof space tourist," Tokarev said before launch. "Withhis approach, he's a real researcher." Tokarev and McArthur are set to spend aboutsix months aboard the ISS and conduct at least two spacewalks during their timein Earth orbit. Both men are spaceflight veterans -McArthur flew three times aboard NASA space shuttles, while Tokarevhas one shuttle flight under his belt - and have each flown to the ISS at leastonce in their spacefaring careers. "I reallymust say that a career in astronautics, a career in being an astronaut, isoccasionally a significant professional and personal commitment," McArthur saidbefore flight, referring to the support of his wife and two daughters who wereat Baikonur Cosmodrome forthe space shot. "I will always be grateful that the three women in my life havebeen at each of my...launches." McArthur had hoped to return toEarth in May 2006 aboard a NASA space shuttle, though ISS mission officialssaid Thursdaythat he will likely ride aboard Soyuz TMA-7 with Tokarevduring an April 2006 decent. The launch of NASA's next shuttle mission is in questionas the U.S. space agency recovers from damage caused by Hurricanes Katrina andRita and continues ongoing troubleshooting to solve launch debris problems withspace shuttle external tanks. "With thisexpedition we're kind of getting ready for the return to flight of the spaceshuttle next spring," Gerstenmaier said. The spaceshuttle Discovery is slated to launch the STS-121 mission - a second orbiter test flightto evaluate fixes made after the loss of Columbia and its crew in 2003 - in March2006, though NASA officials have saidthe flight may likely fly later in May 2006. The STS-121 flight will followDiscovery's recent STS-114mission. But despite the shuttle's delay, itis vital for the completion of the space station, which McArthur said is key for NASA's vision of sending human explorers back to themoon and on to Mars. "We don'thave the answers we need to send people to Mars yet," McArthur said. "We know alot of the questions, but we need to have the space station to answer thosequestions."